Occasionally revamping a company’s brand is called for and this often involves a colour change. Staples wanted Vanda Coatings to re-spray their shop framework for re-branding the Aylesbury and Loughborough stores in their provisional company colours. This project was effectively a sample in order for the client to see whether the chosen colours would work. They would then confirm whether they were going to go ahead with the re-brand in a roll out programme. The new colour was orange with a red tint which had actually been the previous colour used on Staples outlets. Management were thinking of going back to this old colour, hence the samples to see if they would still work. 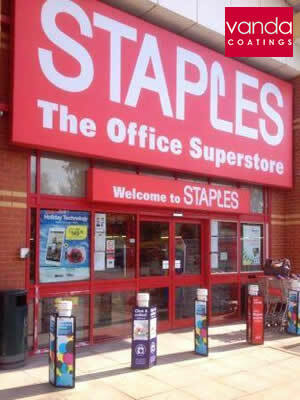 The specification involved re-spraying the new colours on the exterior window and door framework of the Staples store in Aylesbury which was situated in a retail park. There were no other trades working on the site in this instance, but the shop was live, so our Vanda team prepped during opening hours and sprayed after closing time at 8pm. The preparation had to be quite extensive as the original red coating was flaking and peeling. Consequently, the substrate needed quite a bit of sanding down for which an industrial sander was used. As well as sheeting up and masking off (to protect surfaces from any stray paint) our Vanda operatives built a barrier around the working area. This was to protect the public from freshly painted metalwork. All the framework was cleaned down, then bar coat was applied to protect the metal and to form a layer for the top coat to adhere to. In just one shift, the shop framework was re-branded and completely transformed.